Outside screens are available in several standard sizes but can be also ordered in special sizes if requested. Shading nets has also numerous variations between 20-80 % shading capacities. The Mononet A.S.N is an open type of net , even the snow can get through so it provides really good ventilation. 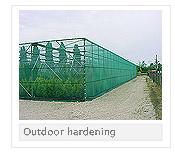 Outdoor hardening places defend against extreme weather conditions such as radiation, UV radiation, wind and hail. They are ideal to acclimatize the plants which were grown under greenhouse but will be transplanted to open ground. 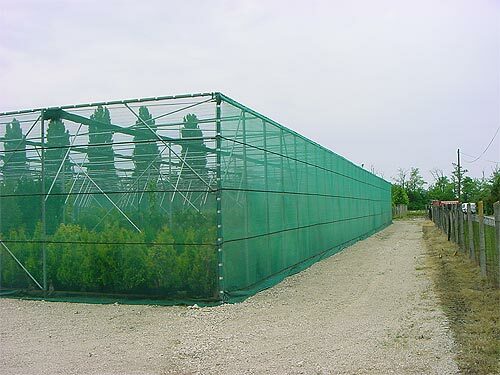 The shading house is a pre-fabricated system which can be assembled easily and quickly by anyone with its flexible, connectible profiles Protection cover can be fixed or moveable screen, shading net, sweep-net and transparent foil if our aim to generate glasshouse effect". If we want also to keep the air cool inside, we can set up screen with aluminium stripes. Based on the demand it's also possible to set it up with roll-up, motor-driven sidewall.